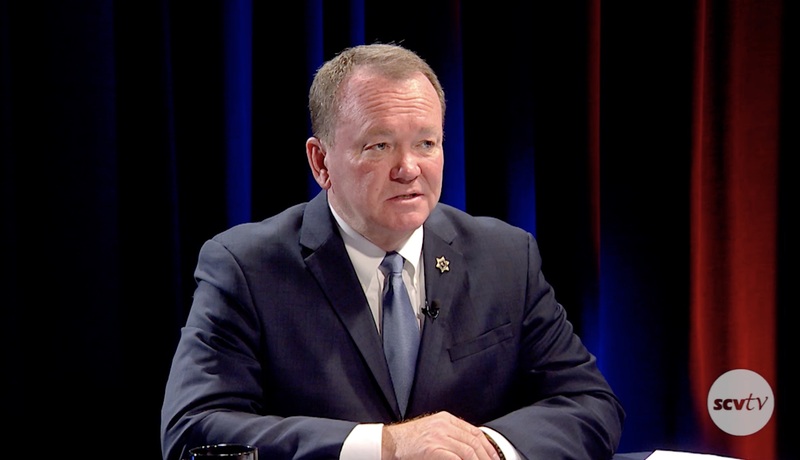 Michele Lutes sat down with Los Angeles County Sheriff Incumbent Jim McDonnell to talk about local, regional and national issues ahead of the November election. Watching the sheriff answer questions one can understand why he was kicked out from the LAPD and placed as a sheriff by the political class. Sheriff McDonnell lacks candor, vision, and direction. He speaks as if wants to be hired as a deputy sheriff, and practiced in front of the mirror with the script of his speech. He was just trying to hit the bullet points. This sheriff can be easily manipulated by the political hacks, attorneys, and of course the Tanaka associates who currently run the Sheriff department. I can imagine the sheriff in a death or life situation having to make a split-second decision. He would freeze and would want to consult with his attorneys before pulling the trigger to save his, or others lives. Pathetic to say the least. Todd Rogers pending lawsuit was not discussed. In lawsuit,former #2 man in LASD Claims McDonnell bribed the other candidates for Sheriff in 2017.